As real estate professionals, we operate at the whims of the buyers. If a trend moves through the market and buyers suddenly want a new type of property, we must respond. While it has not happened all at once, there has been a shift in buyer preferences over the last decade. More buyers today are looking for local amenities such as shops, restaurants, microbreweries, and farmers markets when searching for properties. A common buyer practice is to find a property on an IDX site then hop over to Google Maps or Yelp to see what is around it. Why not bring all that information into one place, so your leads don’t have to leave your site? In this article we’ll introduce neighborhood intelligence and 7 strategies that can boost your lead generation and conversion. Neighborhood intelligence is web content that provides information about a neighborhood or community. In IDX, it is generally produced alongside property listings to provide context about their immediate surroundings. Neighborhood intelligence can take many forms. It can be as simple as a blog post about an attraction in a local community. It can be as sophisticated as a map layer that provides a graphical representation of a neighborhood’s character. Neighborhood intelligence has taken on more importance in recent years as buyers’ preferences have shifted and technology has advanced. But a question remains—how does one represent a community and all its nuance online? This is the essential challenge of neighborhood intelligence. It is one that is being defined everyday. As a real estate agent engaging in IDX, you have the opportunity to make your contributions to neighborhood intelligence by mixing and matching the available strategies. Do this in clever ways and you’ll boost lead generation from your IDX real estate website and pad your bottom line. You may even find a new neighborhood intelligence strategy that gives you a leg up on the competition. To get you started in this venture, here are 7 neighborhood intelligence strategies you can use today. Yelp is one of the most popular websites in the world. 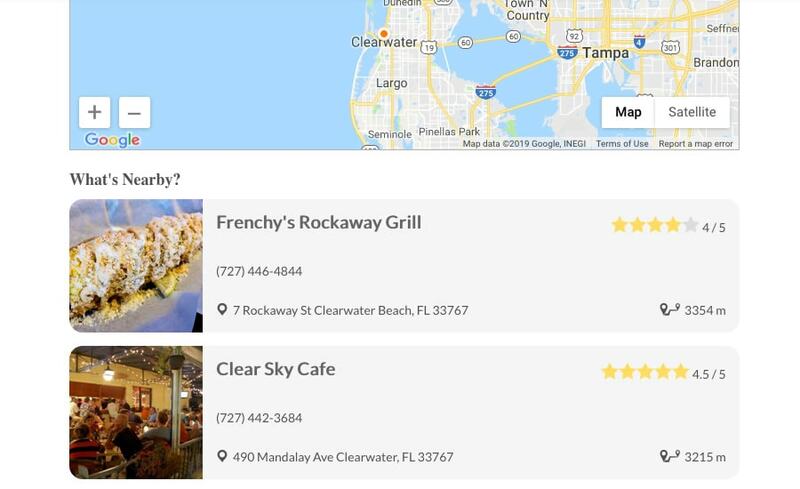 It is built on a model of crowd-sourced reviews of local businesses. Many of us have used Yelp to check out restaurant reviews before booking a reservation. But there is another way you can use Yelp. 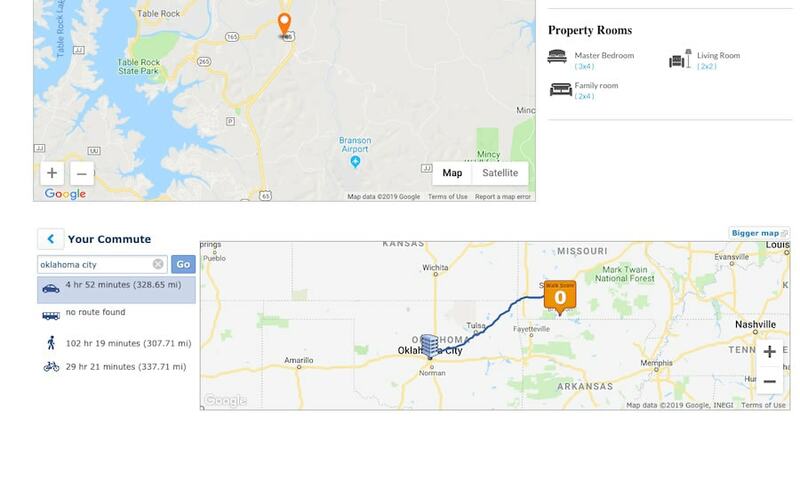 By typing in an address, you can generate a map with all businesses and their reviews around it.Yelp provides this resource in an API that can be integrated with your IDX listings. With the Yelp API, your listings can include a list of “what’s nearby” with photos and ratings. Check with your IDX provider to see if they can integrate Yelp. 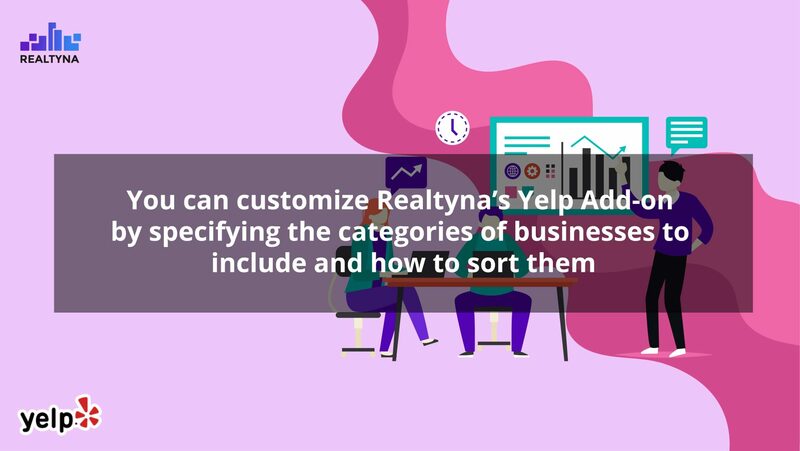 Pro tip: Realtyna can! Sometimes it helps to have some statistics about a place. 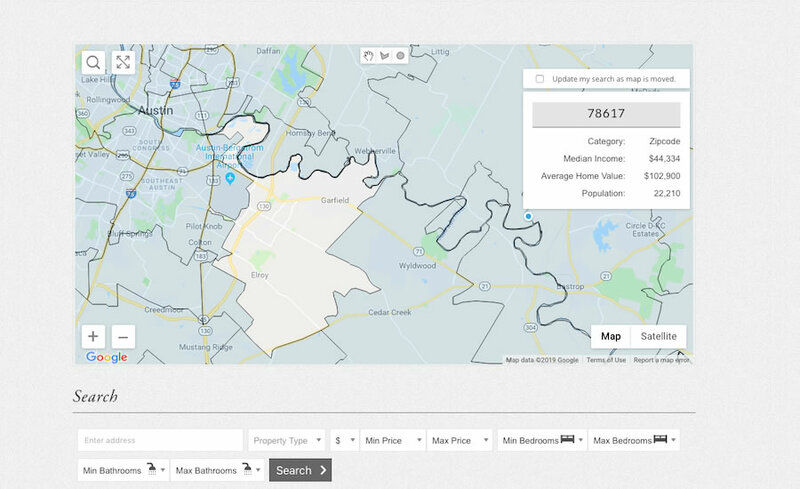 While these figures cannot provide a complete picture of a community, they can help leads understand some basic facts, such as average home value, distance to downtown, population, and tax rate.The best IDX sites add demographic information to the property map as a layer that can be turned on and off. This allows leads to access the underlying data if they need more context, but keeps it from overcrowding the main content—the listings. Neighborhood pages allow you to group listings by their neighborhood or community and create a common landing page for them. You can customize these landing pages to show common points of interest.Neighborhood pages bring the community forward. 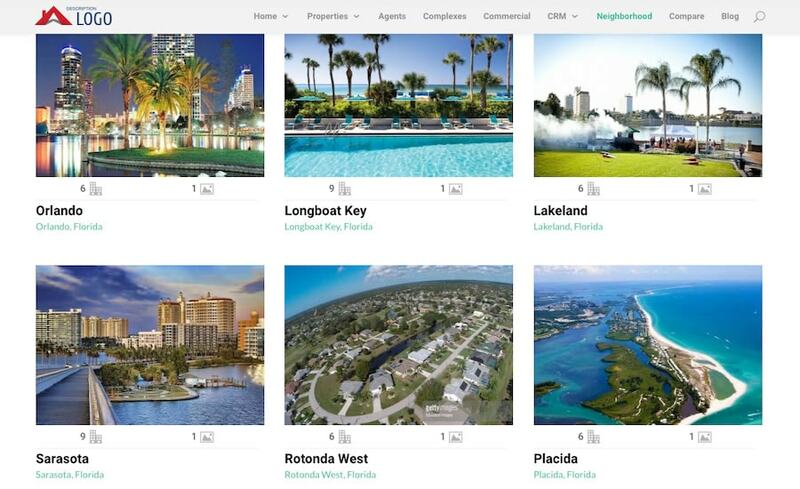 Leads can compare the features of each neighborhood then browse the listings within them. The strongest IDX sites pack their neighborhood pages with original content, such as restaurant and business listings, historical facts, and testimonials from current residents about what it is like to live there. Families often have an additional variable to consider when making a home purchase—schools. 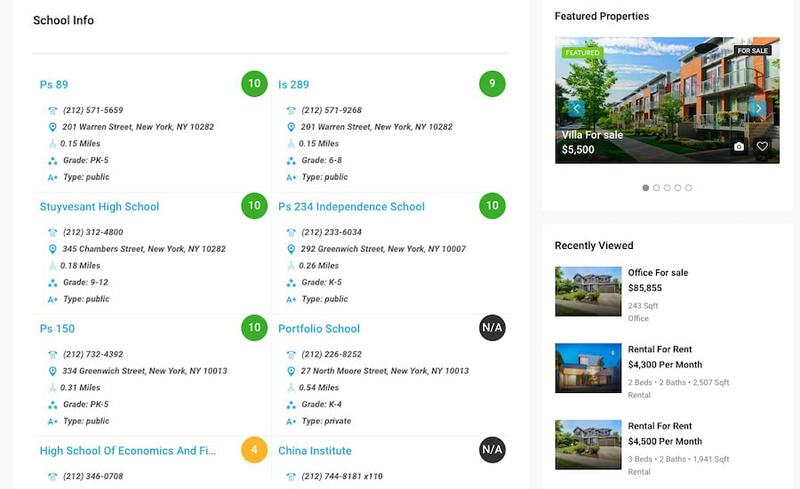 By including school ratings in your IDX listings you can make this decision easier.Greatschools.org offers an API that provides school information and a rating based on state test scores, college readiness, and student progress. Check with your IDX provider to see if they can integrate school ratings. Walk Score is a service that rates a location based on how much is accessible by foot. A home where residents can walk to a coffee shop, grocery store, and a bus stop will rank higher than a home that is a 10-minute drive from any retail business.This is useful information for many buyers. But Walk Score provides so much more. It can plot food, nightlife, and grocery options around the property. If you provide a work address, it can also calculate commute options and the average commute time for each. A blog provides a place where you can distinguish yourself and add value to your site. Because there is so much you can do, your options are virtually boundless with the only limitation being time. If you can establish yourself as an expert in your neighborhood and community, you can generate a base of followers even outside the real estate world. Go far enough, and your blog can be a second stream of revenue for you. Your blog should have highly specific, and original content that leads cannot get anywhere else. This can include best of lists for your neighborhood, interviews with local store owners, before and after photos, recommendations for day trips, and weekend guides. Your content could be anything, as long as it is original. Here is a blog segment dedicated unique doors. Some of these posts get a dozen or more comments. So get creative! What Should I Write About On My Real Estate Blog? By building a local business directory you can show what is available to those that purchase in your area. You can also drive some new clients to local merchants. This is win win. The more traffic local businesses get, the more business that will want to open, the more attractive your neighborhood will be to buyers. The deeper you get into neighborhood intelligence, the more your site will resemble a community resource. This is a good thing. Users that click on your site to read your content are more likely to turn to you for buying a home, even if they aren’t yet in the market. Those that are in the market are more likely to stay on your site because of the wealth of information you provide. 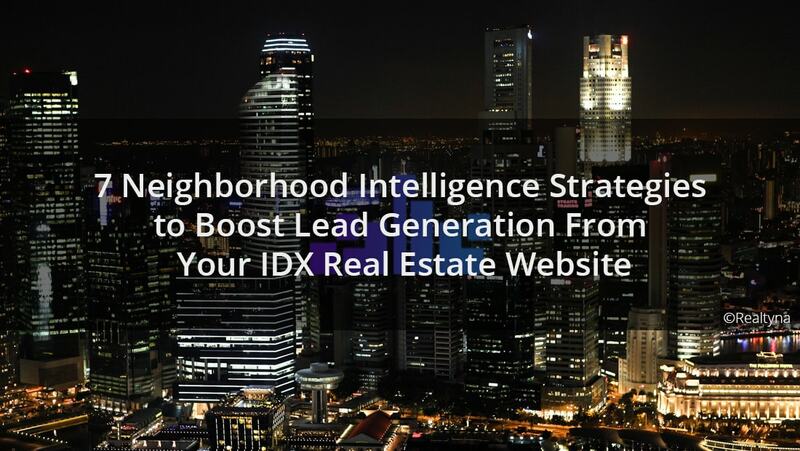 So now you know what neighborhood intelligence is and the strategies to boost lead generation from your IDX real estate website. Questions or feedback? Leave them in the comments. Or for more content, check out Hate Writing? 15 Alternatives to Blogging that can Boost Traffic to your Real Estate Website.